Here, just hours after the 61st edition of the PGA Merchandise Show closed, are a few of the items that caught our attention. 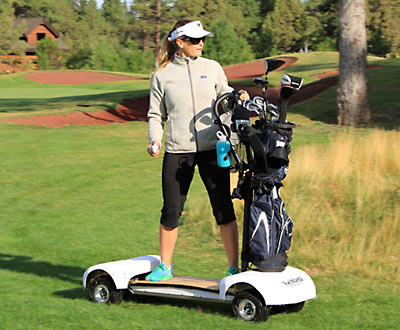 The GolfBoard won “Best New Product” at the Show and attracted a lot of attention. Battery powered and wirelessly controlled by the golfer—or would you call it the rider?—some see this as a way to attract younger/edgier people to our game. Looks like lots of fun even without a golf club. I have to admit I was skeptical when I first saw the BirdieBox but quickly became a convert. Buy a subscription ($45 for one month to $500 for a year) and you receive a box filled with “golf stuff” from a variety of manufacturers each month. They guarantee the items will total at least twice the subscription price and from the samples we saw it’s at least that if not more. Th e Rising Dragon cart bag from WinWin Style has as striking a design as you ever will see with a Japanese stylized dragon adoring the sides. Made with a unique stitching technology don’t expect to find another one in your Saturday foursome. Winston Collection is a company known for its high quality leather goods and their head covers are no exception. Made in the USA they offer 225 colors that can have your name, club logo or event imprint. Veritas Golf showed a new super-high MOI putter that adjustable for total weight and lie plus it is being endorsed by a former commissioner of the PGA TOUR, Deane Beman. 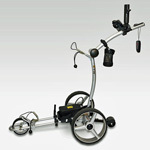 For the golfer who thinks he has everything you can be pretty sure he doesn’t have the Groove Caddy. Hand-held and battery run it cleans the grooves on any club at 1350 rpm. Kit comes with carrying pouch and recharger. Ride a bike…play golf. Makes sense particularly if you want to combine two of your favorite sports. The Golf Bike fulfills the need with wide turf friendly tires and two bags for balance, each carries half your clubs. Many instructors say keeping the upper arms close to the body during the swing is the secret to hitting good shots consistently and the Swing Shirt is a simple way to teach that to the wearer. Zipper hold the upper arms to the chest without and it’s easy to take on and off. Th ough sometimes it seems motorized golf carts have taken over the fairways walking is still one of the true pleasures of the game…even if carrying a bag isn’t. Bat Caddy’s X4R is a lithium battery powered trolley solves that problem, transporting any size bag all day and its remote controlled by the golfer up to 100-yards away plus it folds easily to fit into the car trunk. Whirly Golf makes games and training aids to make golf practice fun for kids of any age. The latest, the Whirly Golf Game, is a castle designed for kids to pitch, chip, and putt golf balls into either outdoors or indoors.